Well, last week’s column on disability parking spaces got a lot of responses. As I explained last week, there is a process to get a disability permit (temporary or permanent) to let one park in those specialized spaces. What might have been unclear is that the permit goes with the disabled person, not the car necessarily. General rule: While there might be a disabled tag on the car, “It shall be unlawful for any person to stop, stand, or park any vehicle in a parking place for persons with disabilities … and unless such person is the person to whom such permit … was issued; the person to whom such permit …. was issued is a passenger … or such vehicle is being used for the transportation of disabled passengers on behalf of the institution to which such permit was issued.” (OCGA 40-6-226). Plain English: The permit is for the use and benefit of the disabled person. The car is not a disabled person. With that being said, the possession of a permit ought to be enough to keep us walking on in the store instead of challenging people about whether they are disabled or not. A doctor issued the permit. The fact that they are walking that day, at that time, doesn’t mean they don’t qualify for a permit. Just be happy that you don’t need a permit. Kelly, my mom has a disabled permit and sometimes I use her car to go get her prescriptions. Can I park in the disabled parking space since what I am doing is for her? Ahh, no. Thank you for taking care of your mom, but that isn’t what the permit is for. IF you mom is going with you, it’s okay, even if she stays in the car. Otherwise, be happy that you have legs which enable you to saunter across the parking lot. Kelly, I don’t have a permit but my mom is obviously disabled. Can I still park in the disability space to assist her getting in and out of the store? Actually, yes. OCGA 40-6-226(b)(1) “It shall be unlawful for any person to stop, stand, or park any vehicle in a parking place for persons with disabilities except for the purpose of allowing a disabled person to enter or get out of such vehicle while in such parking place.” Now let’s say that you decide to roll mom in her wheelchair up to the front door so that you can legally park the car? Is that covered? I hope so. But disappearing with mom inside the store would be a violation of the permit law and depending on how long you take, you might have a sizeable ticket on your car when you get back. Kelly, having a disabled child, it really aggravates me when people park next to a disabled spot but in such a way as to make it useless for its intended purpose. Is there a law against that? Yes, there is. OCGA 40-6-226(e): “No person shall park a vehicle so as to block any entrance or exit ramp used by persons with disabilities on public or private property. Knowing that many such infractions take place as people figure that they will only be a “minute”, some cities have taken to allowing disabled parking enforcement persons to issue the ticket. East Point, for instance, lets a disabled person come in and get certified to issue these parking citations. But the person so applying has to likewise be disabled. Now that’s curious. Looks like it’s all symbolism but largely ineffective I bet as disabled persons have enough on their hands than to be looking for parking violators. And as to taking only a “minute”, the law has been held not to require a “harmed person.” That is, the cop doesn’t have to go find someone who would have used the space but for the violation. 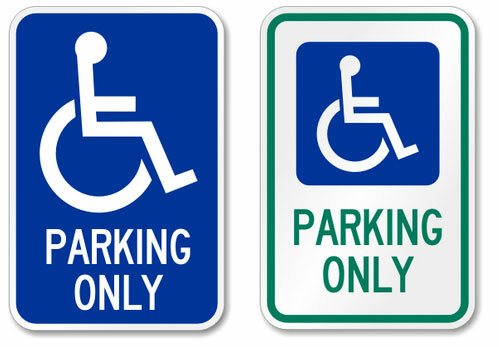 The conviction for a disabled parking citation results in a non-fingerprint misdemeanor with a fine of $100 to $500. No jail time is specified. Also, IF the disabled parking space sign included language that an offender is subject to having their vehicle towed, that too could be a financial consequence.